Still making Easter Religious cards for my MIL. 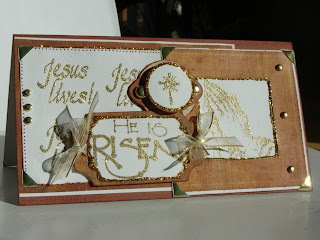 This is the next one I came up with using the few religious stamps I own... I layered and framed the praying hands, added gold brads to both ends and gold photocorners for that extra lift. I also borrowed a little bit of that oh so beautiful gold ribbon from Maria's scrappy kit - but sshh, please dont tell her. :) What do you think? Another beautiful card! I love all the gold! Hey, the ribbon was suppose to be for the box!! LOL! But that's okay. . .it really fit well with your card. You're excused! LOL!